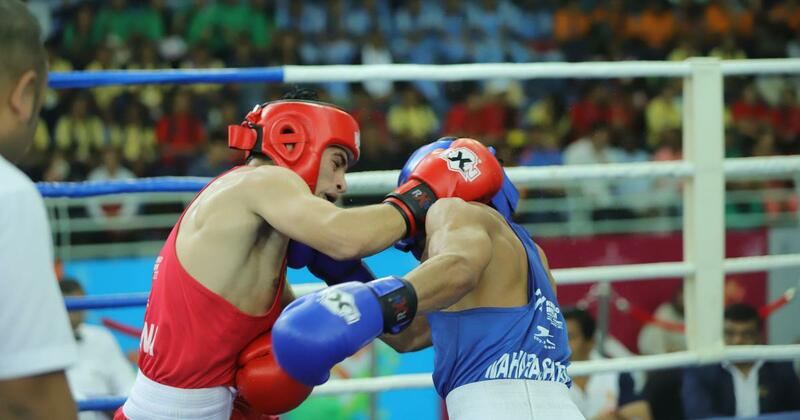 Haryana bagged 10 gold medals – including eight in boxing – on Friday. 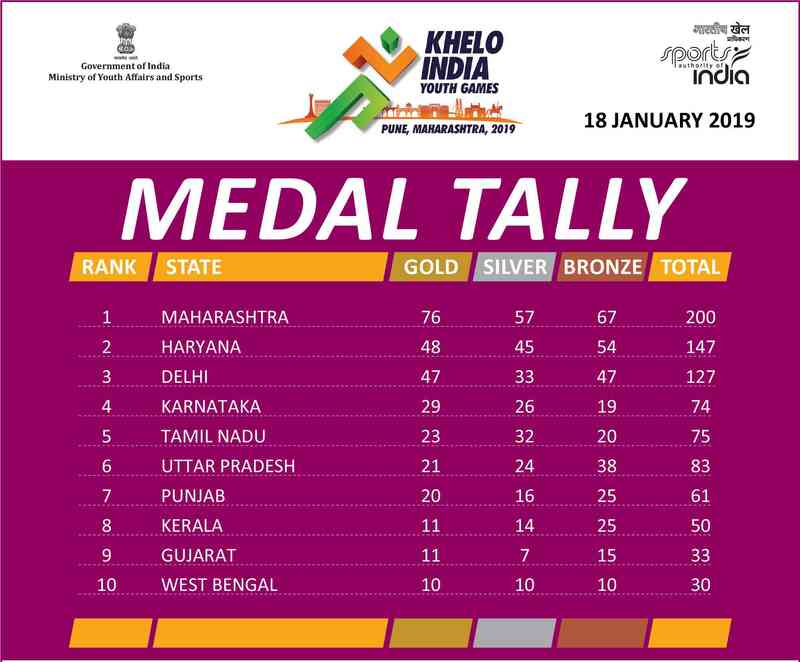 Haryana, on Friday, had a rich haul of medals with two more days to go in the Khelo India Youth Games as hosts Maharashtra touched a new milestone of 200 medals. Haryana, who topped the medals tally in the last Khelo India School Games, bagged an incredible 10 gold medals along with eight silver and 15 bronze. They, with 48 gold medals, 45 silver and 54 bronze, are second in the medals’ tally. They pushed Delhi (47 gold, 33 silver and 47 bronze) to the third spot. Table toppers Maharashtra increased their gold medal tally to 76, winning eight on the day (five from boxing, two from tennis and one from table tennis). Maharashtra, with 76 gold, 57 silver and 67 bronze, have 200 medals. While Haryana displaced Delhi in the second spot, Gujarat moved from tenth to ninth after Dev Javia won the tennis singles gold medal. Haryana boxers Ankit Narwal (Boys Under-17, 52 kg), Vanshaj (Boys Under-17, 57 kg) and Preeti Dahiya (Girls Under-17, 60 kg) won comfortably. Manipur’s Noarem Baby Chanu (Girls Under-17, 52 kg) and Hu Ambeshori Devi (Girls Under-17, 57 kg) picked gold medals. The team also won two silver medals besides three bronze medals. Maharashtra also had a profitable day from the boxing hall. Devika Ghorpade and Mitika Gunele won a gold medal each in their respective categories. Yaiphaba Meitei, who originally hails from Manipur, but is representing Maharashtra, also added to the team’s gold tally. In tennis, Madhya Pradesh’s Mahak Jain won the Girls Under-21 gold medal beating Maharashtra’s Mihika Yadav 6-4, 6-1, while Dev Javia of Gujarat powered past Aryaan Bhatia of Maharastra 7-5, 6-3 to win the Boys U-17 singles gold medal. Maharashtra won the gold medal in both doubles contested on Friday. Host state’s Armaan Bhatia and Dhruv Sunish won the Boys-Under 21 doubles beating Ishaque Eqbal and Nitin Sinha of West Bengal. The win gave Dhruv a chance to do a double as he plays the singles final on Saturday. Haryana won two of three finals they played. Haryana beat Chattisgarh in the Girls Under-17 final. Their Boys Under-17 team beat Rajasthan for a second gold. However, Himachal Pradesh stopped the Haryana juggernaut, beating them in the Girls Under-21 final. Haryana had failed to make the Boys Under-21 semi-final but they compensated by winning two gold and one silver medal in the other three sections. Chinmaya Somaiya won the Boys Under-17 singles event beating Delhi’s Yashansh Malik to increase Maharashtra’s gold medal count. Madhya Pradesh’s Anusha Kutumble beat Chitale Diya Parag of Maharashtra in Girls Under-17 singles final. Haryana overpowered Odisha 2-0 to set up a title clash with Jharkhand in the Girls U-21 hockey event at the National Defence Academy Campus in Khadakvasla. In the first semi-final, Jharkhand beat Punjab 3-0. The U-17 girls section will also see a Haryana-Jharkhand face-off for gold medal on Sunday. The gold medal matches between Haryana and Jharkhand in both Under-17 and Under-21 will be held on Sunday, while the bronze medal play-offs will be held on Saturday, with Odisha meeting Punjab in Under-17 and Under-21 event.